By thinking of pedagogy and the design of learning activities as akin to the exoskeleton of lessons, we can share the relevance (the ‘so what’?) of the learning by pointing out to learners exactly where the joints, connections and overall structure of the learning is and how it all fits together. In doing so, we offer a chance for them to grab on to the bones of the lesson and find their own way around complex knowledge, difficult concepts and new applications with each other. Making our pedagogy visible to learners is a fantastic way to deliberately involve them in the process of learning. It provides a great opportunity to introduce and establish a shared language of and for learning. It also offers a chance to share effective practice across the school. 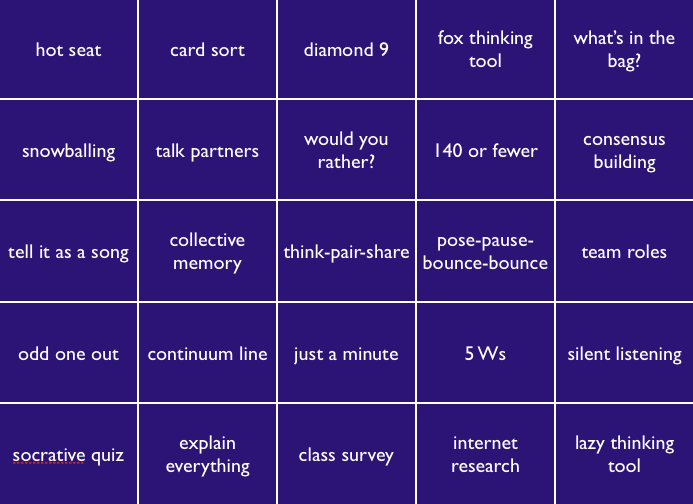 Jim Smith (@thelazyteacher), often talks about creating a sort of bingo card for learners to record all the different activities and ways they are asked to show their learning that they encounter during a series of lessons. Such a card could include presentations to the class, extended writing, role play, posters and so on. To squeeze even more learning out of adopting a visible pedagogical approach, we can ask learners to do more than just record what they experience. We can encourage them, as part of regular reflections on their learning, to demonstrate their understanding of how these activities help them learn and, most importantly, how confident they are in learning as a result of thinking in this way. From this point, learners could create their own activities for each other according to what will work BEST for the topic and phase of learning they are in. By deliberately integrating this as part of on-going self-reflection, we also avoid straying into the soul-destroying conversation many of us will have experienced over the years which goes something like, ‘I am a kinaesthetic leaner, so I can’t write any of this down.’ Instead, learners will become more discerning about what activities work best for them, when and why. Learners will become aware that some activities are more challenging for them than others and so they need tom consciously can invest more effort to become better at these. They will become more involved in their own learning process and gain access to what is often referred to as the ‘secret garden’ of the curriculum and the ‘so that’ of learning outcomes. Once our pedagogy is visible to us, we can challenge ourselves to reflect on the very specific strategies we have tested and identify the impact on learning and develop ways to further develop these. Cross-departmental collaboration: We can collaborate with our colleagues both within and beyond our teams to create five new activities or strategies or try an existing one in a new and unfamiliar context. Student representatives: If you have student representatives in department meetings, this approach provides the students with a script of learning to which they can add, share experiences from other subject areas and teachers and authentically contribute to the development of teaching and learning across the school. Self-efficacy of learners: Imagine a time when learners have such high levels of agency that they feel confident enough with their language of learning and pedagogy to select from their own learning repertoire effective strategies to develop their knowledge and understanding. Or a time where they come to their lessons and point out that they have ‘done’ card sorts in their last three lessons, so please could they use a different technique today? Then you can invite them to decide what strategy/ pedagogical approach would enable them to best meet the success criteria of the task. And, once the activity is completed, with you, they can self and peer assess their outcomes by reflecting on whether the strategy they chose was the most effective based on how well they met the success criteria. The next step could be to design the way they will organise the next task, giving them an opportunity to lead their own learning for the outset, anchored by the assessment criteria against which they will measure their progress. This entry was posted in 21st Century Learning, Creativity, Expert Pedagogue, Inspiration by fullonlearning. Bookmark the permalink. 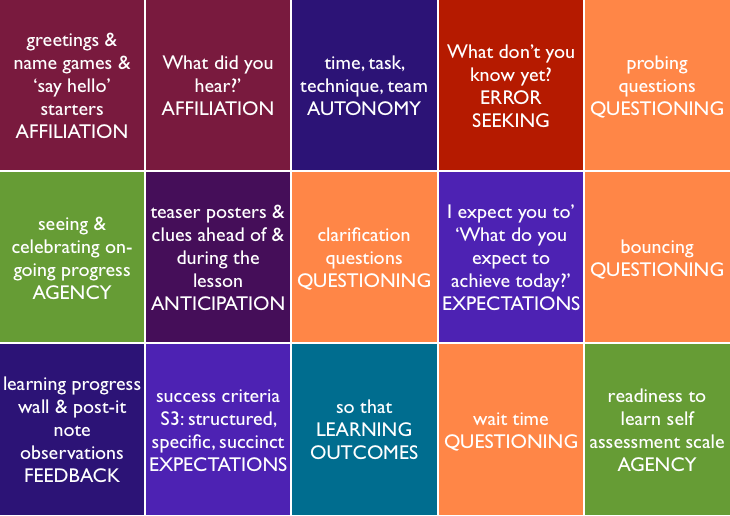 Reblogged this on Embedding Differentiation and Challenge. 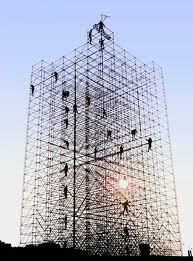 I LOVE the scaffolding analogy you use here. To my mind, there’s no better way of helping students to take stuff on board than showing them connections, relevances and structure. I thank the excellent science teachers I had (back in the day) for the success I experienced in those fields. They gave me the confidence to stick with it, until the clouds started to clear and I could see the structure for myself.